Class X Pin Gages have an allowed deviation of .00004" (tolerance limit), a geometry of .00002" (roundness limit), and a finish 4 micro-inch Ra. They are ideally suited for applications in which precision is critical. Class X Pin Gauge Sets can also be used for calibrating measuring equipment to ensure accuracy. These pins are perfect for critical inspection needs or when to maximize GO/NOGO tolerance limits. Class X pin gages also provide an ideal solution when calibrating measuring equipment, micrometers and calipers. 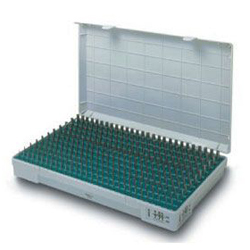 Browse our online catalog of Class X Pin Gage Sets and libraries to learn more about the specifications and features of each item. Manufactured in the USA by Meyer Gage and fully inspected to ensure they are 100% accurate, Our selection of Class X Pin Gauge sets and libraries by Meyer Gage are offered in a full range of English sizes. 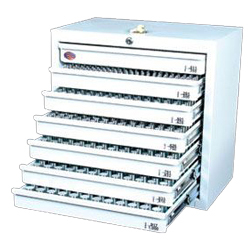 Additionally, every gage has been inspected and features a 2-microfinish or better, and has been heat-treated to a hardness of 60-62 Rockwell C for durability. If you have a question, please contact our representatives. For more information, to receive a quote, or to place an order, please contact us at (800) 767-7633.